Set out chronologically from 1939 to 1946, Mark Harris' sweepingly ambitious book charts the shockwaves that the Second World War sent through Hollywood, and the lives and careers of five of its most prominent directors. They were cushioned by government bureaucracy on all sides, with the American government uncertain or unable to agree on how best to employ its most talented filmmakers in the art of propaganda. The men (Frank Capra, John Ford, George Stevens, John Huston, and William Wyler) were loosed to all four corners of the globe in search of newsreel footage for hungry American audiences, eager to see the most recent news from the front. The story follows John Ford as he captured the Battle of Midway, George Stevens' horrifying newsreel footage of the camps at Dachau, Frank Capra's 'Why We Fight' series, and William Wyler's story of the heroic pilots of B-17 bomber Memphis Belle. John Huston also shot much valuable newsreel footage, alongside training material and documentaries. One of the most memorable is arguably Let There Be Light, featuring veterans housed in a special facility for serious post-traumatic stress disorder. The searing footage was censored until the 1980's, like much of Ford and Huston's footage of the carnage at Normandy. The sheer scope of research involved with Harris' undertaking shines through, revealing anecdotal details and sometimes discrepancies which mark the characteristic self-inflation or myth-making of each director - particularly Huston, who had a flair for retelling stories with increasing distance from reality. Harris leaves no stone unturned, organising a vast amount of information from archival war papers and personal letters into a thoroughly digestible, entertaining narrative of Hollywood's war years. The brief, fervent anti-Nazism of Hollywood coincided with its alignment to our Soviet allies - a position banished from American mindsets and cinema screens forever once the war had ended and anti-Communism reigned supreme. It's enlightening to see the burgeoning political factions at work in 1939, when a group of isolationists held Senate investigations into Hollywood for producing pro-war propaganda. The Nye Committee charged Darryl F. Zanuck and Jack Warner particularly, but the studio heads and their lawyers were much too wily and articulate for the committee, who were essentially laughed out of Hollywood. With the backstory sketched in, it is fascinating to think of how these various factions would coalesce into the paranoid postwar landscape. The American government is shown to be both wary of Hollywood's massive popular influence and hoping to harness it, and one cannot help but to think of the influence of the war in relation to the Paramount Decree, which saw the government dismantling of vertical integration in 1948. George Stevens' story was of particular fascination for me, and the book offers great insight into how the war in many ways both established him and permanently darkened his worldview. After witnessing Nazi atrocities, he decided never to make a comedy again. When the war ended, he was left at something of a loose end, while the more established directors, like Wyler and Ford, drew on their experiences to make The Best Years of Our Lives and They Were Expendable, respectively. Of course, Stevens went from strength to strength in the 50's, with output like A Place in the Sun and Shane. Harris also proves insightful on the complexity of a man like Frank Capra, whose reactionary and conflicting political views often interfered with the cohesiveness of his work. After the war, which Capra mostly spent in Washington, he made what many consider to be his enduring masterpiece, It's a Wonderful Life. It was to be the last noteworthy mark in the director's career, which petered out with astounding speed in postwar America. 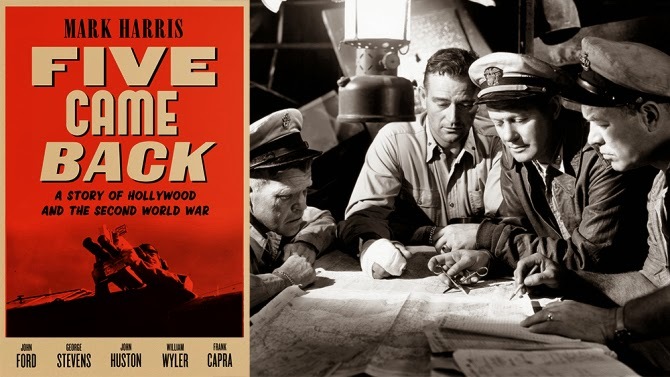 Five Came Back not only reveals the irrevocable changes war would bring to these directors and their work, but the greater power struggles and political maneuvering of the Hollywood studio system. Both as a historical document and a detailed look into the motivations and experiences of these men, the book is essential reading.